Whoa! I’m still shaking after ripping into this box. You would be too if you lifted the lid and saw the card I pulled. Buybacks are great. There are lots of well designed cards floating around that don’t carry much value. Buying them back and adding an autograph can make all the difference. I can’t tell you how many times I’ve opened a product and said to myself “Man, this card would look cool if it had an on-card autograph.” That’s exactly what buybacks do. 2017 Topps Archives Signature Series Active Player Edition is a picture perfect example of a quick-thrill product. Boxes range in price from $50 to $70. Inside each box you’ll find (1) encased autographed buyback card. Unlike previous releases, this product focuses on current players instead of retired stars. Yes. Products like this are a gamble. But what product today isn’t? The best thing about products such as this is that the format allows high-rollers to get their fix, while player collectors get to pick-up some very affordable autographs on the secondary market. To put it simply, the format/price may not be for everyone, but the cards overall appeal to a large audience. My favorite thing about buybacks are when Topps gets athletes to sign their rookie cards. Then its a double whammy. Not only do you get an autograph, but a rookie card too. Here is what I pulled… brace yourself. The 2015 Little League World Series came to an end last Sunday. Japan beat Red Land 18-11. Everyone has gone home. All the pins have been given out. Although it wouldn’t surprise me if some of the businesses in Williamsport still have some pins available. I think they tend to order a lot of them. Dairy Queen still had pins leftover from last year. 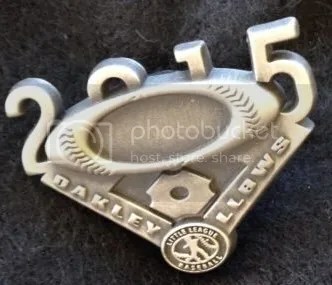 Starting in 2014, Oakley began to make pins for the Little League World Series. Those pins were specifically made for the players though. The only way normal people could get one is to trade for it or buy one on eBay. That pin can run $100.00+. Oakley returned to the Little League World Series again this year. This time they brought two different pins with them. Players got the all silver colored pin pictured above. More of the 2015 player pins have popped up for sale. But they still can be expensive at around $50.00 – $150.00. The other pin they gave out looks almost identical to the one the players got. The main difference is that the “2015” is in red and blue. I think they may have been given to the public through some type of promotion at the Oakley booth. Even those weren’t easy to get.